I'm all for fruit and veggies for snacks, but - sometimes - mama needs something extra sweet to satisfy. 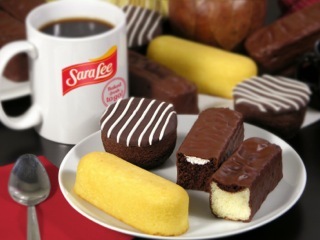 I was excited to see a new line of snack cakes from Sara Lee in my grocer the other day. I had sampled a few of these goodies the week before, and they are decadent, rich, and totally what I need once in a while. There are many varieties available, which is great for my diverse family. Our favorites so far have been the crumb cakes and golden fudge cakes. All of the frosted cakes have a rich and gooey topping that makes it so I can only eat one (or sometimes even half of one.) I love them with my coffee! And if you aren't a fan of covered cakes, the buttery sunshine cakes are moist and without frosting! Learn more about this exciting new development in snacks at the original Sara Lee Snack Cake Facebook page! Wanna Save? Check out this coupon offer!